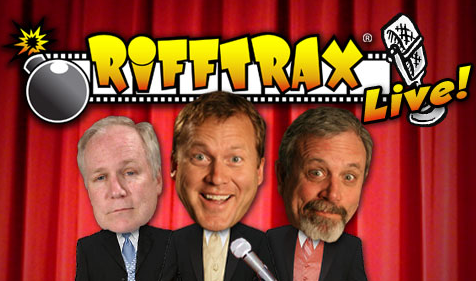 How To: Make Home: RiffTrax Live: Comedy Tonight! Ah, Thursday night and what to do? It's been long enough from the weekend that you are looking forward to getting out of work and out of the house, but it's still a week night so it can't be too crazy. A night at the movies may seem like a good, but over done solution. So why not go to a live comedy event at your local movie theater? That's where RiffTrax Live comes in. RiffTrax is one of my all time favorite week night activities. The three men responsible for Mystery Science Theater come together to create a unique comedy experience that people around the nation can attend. Essentially they take a movie, a really truly horrible movie, and they play it in a movie theater while they stand on stage and make jokes about the movie, live. It's like watching one of those "so bad, it's funny" movies with your witty best friend. Then they broadcast the experience to movie theaters all over the country. This happens about 4 times a year and it's always a fun and inexpensive night out. So what movie are the Riffers making fun of tonight? How could it be anything other than Sharknado? 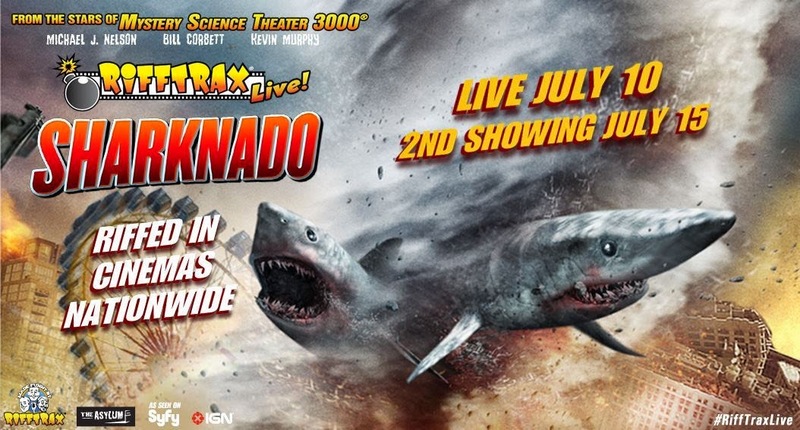 Of all of 2013's movies, Sharknado was the worst. And it was so bad, it was pretty funny. There was a little bit of everything from weather patterns not matching up from one view to the next, terrible writing, cheesy love scenes, unrealistic looking loss of limbs, characters that lack all common sense, and, of course, a tornado made of sharks. Now imagine this with a funny commentary running over it the whole time and you've got what tonight's RiffTrax will be like. Ticket prices vary based on your location and remember, this is a live comedy show and therefore not rated. For a ball park idea, my hubby and I paid $12.50 each for our tickets. If you want to buy tickets or find out more information about tonight's show, visit the Fathom Events website. I posted all of the locations below. To buy tickets for a specific location all you have to do is click the 'Buy' hyperlink next to the name of the theater. You can also buy them at the theater itself, but many locations do sell out in advance. If you go, let me know what you thought in the comments! I did the same thing! I still have suspicion that even the producers don't take the movie seriously. I mean, the tag line was "Enough said!" Omg this looks so fun! I still haven't seen sharknado haha! Oh, I remember watching Mystery Science Theater 3000! That was pretty hilarious. This sound like a really fun outing, hope you guys love it! I have never heard of something like this before, it sounds really interesting and unique! Thanks so much for your kind visit. Have a wonderful warm weekend! sounds like a fun time! 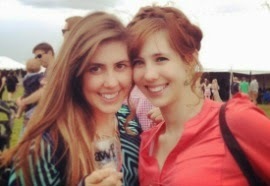 have a great weekend doll! woh such a complete post! This is my first time hearing of this! Interesting.